LEFT: 8. Caudal vertebra of Prognathodon crassartus: a) from behind; b) from below. Figure adapted from from Plate 26 of Cope's (1875) Vertebrata of the Cretaceous Formations of the West. AMNH FR 1562. "Liodon; a large species near to L. proriger, Cope. It is represented by dorsal, lumbar and caudal vertebrae, by ribs, and by bones of the extremities. ..."
Although Cope later refers to the note as "Proc. Amer. Phil. Soc., 1871, 168" as if it was published in 1871, it wasn't actually published until 1872. Cope's reference was repeated by Williston in 1898, adding to the difficulty involved tracking this specimen. The full citation is: Cope, E. D., 1872. Note of some Cretaceous vertebrata in the State Agricultural College of Kansas. Proceedings of the American Philosophical Society 12(87): 168-170. Liodon large species near L. proriger, Cope, Proc. Amer. Philos. Soc., 1871, p. 168. This saurian, which is similar in size to the last [mentioned; i.e., "Liodon latispinus"] is represented by a series of dorsal lumbar and caudal vertebrae with some bones of the limbs. The vertebrae are as much distinguished for their shortness, as those of L. latispinus are for their elongation. ... The remains above described were obtained by Professor B. F. Mudge, near Eagle tail, in Colorado, a few miles west of the line separating that Territory from the State of Kansas." Note Cope's reference to "Eagle tail, in Colorado" - it's a mistake that has continued to the present. Cope, E. D. 1872. Catalogue of the Pythonomorpha found in the Cretaceous strata of Kansas. Proceedings of the American Philosophical Society 12(87): 264 and 12(88): 265-287. Cope, E. D. 1872. [Sketch of an expedition in the valley of the Smoky Hill River in Kansas]. Proceedings of the American Philosophical Society 12(87): 174-176. By the time that Cope had published his 1875 "Vertebrata of the Cretaceous," he had also changed his mind about the genus, and called the specimen Platecarpus crassartus (p. 153-155). 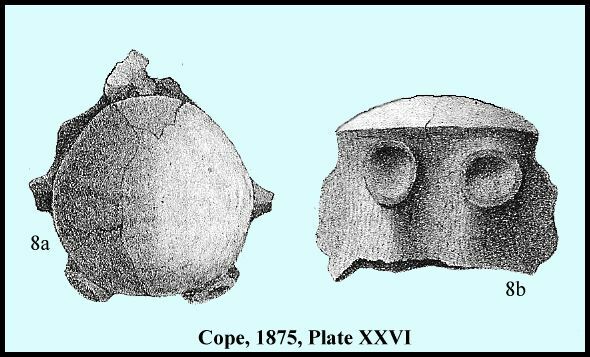 He noted again that the "remains described above were obtained by Prof. B. F. Mudge, near Eagle Tail, in Colorado, a few miles west of the line separating that Territory from the State of Kansas." On page 268, Cope listed his previous references as "Liodon crassartus, Cope, Proceedings of the American Philosophical Society, 1871, 168 and December." He also figured a portion of the specimen on Plate XXVI, figs. 4-12. The figures include several vertebrae, the humerus, femur and fibula. Cope, E. D. 1875. The Vertebrata of the Cretaceous formations of the West. Report. U. S. Geological Survey Territories (Hayden). 2: 302 pp., 57 pls. TOP: 8. Caudal with diapophysis: a) from behind; b) from below. LEFT: 4. 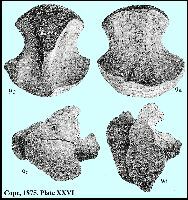 Middle dorsal vertebra of Platecarpus crassartus Cope, from Professor B. F. Mudge's collection: a) from front. 5. 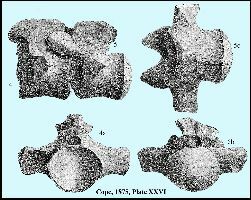 Adjacent vertebra of same: b) from behind; c) from below. The specimen was mentioned briefly by Merriam (1894, p. 31) who indicated that it is from the "Niobrara of Colorado." Merriam, J. C. 1894. Ueber die Pythonomorphen der Kansas-Kreide. Palaeontographica 41: 1- 39, 4 pls. Williston (1898, p. 180) was the next to comment on the specimen, reporting it as Platecarpus crassartus, but disagreeing with Cope about the identification. Williston believed it was more likely something like Prognathosaurus [Prognathodon] Dollo. He also noted that it "evidently has strong relationships with Brachysaurus, and I would have referred it to that genus save for the free chevrons [on the caudal vertebrae]." As it turns out, he was right to be concerned, but it would take 90 more years for someone to notice. Williston's Brachysaurus was later found to be pre-occupied by Hallowell, 1856, and Williston's B. overtoni (1897) from the Pierre Shale of South Dakota was eventually referred to Prognathodon Dollo 1889. Prognathodon means "forward jaw tooth," describing the way that the anteriormost teeth extend forward beyond the end of the jaws. Although Williston (1898) repeated Cope's locality as "Eagle Tail, in Colorado," he said that he had visited the place where the specimen was collected with Professor Mudge. He stated that it was definitely "within the borders of Kansas," and it was clearly from in the Fort Pierre (Shale). However, since that time, the locality has remained somewhat of a mystery. Williston (1898, Plate XLV) figured a vertebrae, humerus and an unidentified paddle bone. Williston, S. W. 1898. Mosasaurs. The University Geological Survey of Kansas, 4(5): 81-347, pls. 10-72. Lane (1946, p. 315-316) noted that Platecarpus crassartus was from the Fort Pierre of "extreme western Kansas" and essentially repeated Williston's remarks. Lane, H. H. 1946. A survey of the fossil vertebrates of Kansas, Part III, The Reptiles. Kansas Academy Science, Transactions 49(3): 289-332, 7 figs. Russell (1967, p. 164) was the next to comment on the specimen and formally referred the specimen to Prognathodon crassartus, noting that it came from the "Pierre Formation near Eagle Tail, Kansas." He also noted that only five vertebrae of the type could be located. Russell, D. A. 1967. Systematics and morphology of American mosasaurs. Peabody Museum of Natural History, Yale University, Bulletin 23. This might have been a good place to end the story, but some issues in paleontology are never really settled. In their paper on Prognathodon, Lingham-Soliar and Nolf (1989, p. 171) noted that the vertebrae and the humerus of the specimen found by Mudge are very similar to those of European specimens of Plioplatecarpus, and added that ""Prognathodon" crassartus seems to be clearly referable to Plioplatecarpus." In addition, Bell (1993, p. 20) wrote "... Prognathodon crassartus (= Plioplatecarpus indet., see also Lingham-Soliar and Nolf, 1989: 171)." While it is quite likely that they are correct, neither paper referred to the specimen by number (AMNH FR 1562) or indicated that the actual remains had been examined. In comparing the humerus, Lingham-Soliar and Nolf, it seems clear that they were using the drawings provided by Cope (1875) since Russell (1967) noted that the humerus was no longer present in the specimen. Everhart and Bussen (2001) reported the first remains of Plioplatecarpus cf. primaevus from the upper Sharon Springs Member of the Pierre Shale, near McAllaster, in western Logan County, Kansas. According to Pete Bussen (pers. comm, 2005), this is the same stratigraphic level as the exposures south of Sharon Springs that probably produced the remains found by Mudge in 1870. The specimen consisted of most of the skull, one cervical and several dorsal vertebrae and some ribs. Interestingly, the ribs were noted to be round in cross-section, a feature typical of Plioplatecarpus, and also reported by Cope (1875, p. 154). The current (February, 2005) records of AMNH FR 1562 note the locality as "Eagletail, CO near but in KS." The record also notes that the specimen consists of "6 vertebrae: 2 dorsals, 1 pygal & 3 caudals. Parts of type missing." Sharon Springs is about 10 miles west of old Fort Wallace, sitting on the Union Pacific Railroad, and is right in the middle of the Pierre Shale in Wallace County, Kansas. The specimen probably came from canyons in the Pierre Shale south of the town. According to Peterson (1987), Mudge was collecting in the vicinity of Fort Wallace during the summer of 1870 and would have referred to the town as Eagle Tail when he collected the specimen. Mudge probably sent the material to Cope later that same year. Its just a small bit of data but it does put Prognathodon in the lower-middle Campanian in Kansas. As far as I know, its the only record. Peterson, J. M. 1987. Science in Kansas: The early years, 1804-1875. Kansas History Magazine 10(3): 201-240. Credits: Earl Manning contributed to this page. Baird, D. 1986. Halisaurus and Prognathodon; Two uncommon mosasaurs from the Upper Cretaceous of New Jersey. The Mosasaur 3: 37-45. Christiansen, P. and N. Bonde. 2002. A new species of gigantic mosasaur from the Late Cretaceous of Israel. Journal of Vertebrate Paleontology 22(3): 629-644. Everhart, M. J. and J. Bussen. 2001. First report of the mosasaur, Plioplatecarpus cf. primaevus, from the Pierre Shale (Campanian) of western Kansas. Kansas Academy of Science, Transactions 20: 28-29 (Abstracts). Kass, M. S., 1999. Prognathodon stadtmani: (Mosasauridae) A new species from the Mancos Shale (Lower Campanian) of western Colorado. in Gillette, D. D. (ed.) Vertebrate Paleontology in Utah, Utah Geological Survey, Miscellaneous Publication 99-1: 275-294. Lingham-Soliar, T. and D. Nolf, 1989. The mosasaur Prognathodon (Reptilia, Mosasauridae) from the Upper Cretaceous of Belgium. Bulletin de LInstitute Royal Des Sciences Naturelles de Belgique, 59: 137-190. Schulp, A. S., G. H. I. M. Walenkamp, P. A. M. Hofman, B. M. Rothschild and J. W. M. Jagt. 2004. Rib fracture in Prognathodon saturator (Mosasauridae, Late Cretaceous). Netherlands Journal of Geosciences / Geologie en Mijnbouw 83(4): 251-254. Williston, S. W. 1897. Brachysaurus, a new genus of mosasaurs. Kansas University Quarterly 6(2): 95-98.